A graduate majoring in History in 1974, from the Mandalay University. Got married in 1975. Used to be a primary and Junior assistant teacher at the Government Schools. 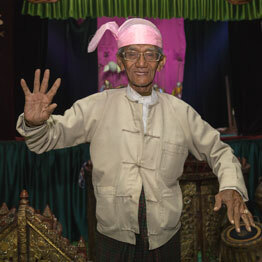 Quit the government job in 1987 and founded the Mandalay Marionette Theatre especially for the tourists first in 1990. Started teaching private Spoken English Classes in the same year. Her father is Gondu U Thein Naing, who wrote and published a book about the history of Myanmar colourful puppets in 1968 and won the National prize. She was along all the interview trips with her father to the master puppeteers. Since she is a daughter of U Thein Naing, she has a strong passion and obsession with Marionette. And she tried to reorganize the disbanded Shwebo Tin Mg’s puppet group and performed the all-night local puppet shows in many villages like in the olden days. She won the prizes individually or in group at the annual performing arts competition. Since 1998, participated in many International Puppet Festivals in different countries such as Thai, Singapore, Philippine, Malaysia, Taiwan, Japan, Indonisia, USA, Maxico, Morroco, Finland, Switzerland, Holland, France, Germany, Belgium and Austria. On the other hand, as a writer, she wrote and published two books especially about the Myanmar Marionette. They are the collection of articles about the Marionette and her life and are translated into English as well. The third book names ‘From the hand that rocks the cradle – Pahket Hlwe thaw Let hma Thi’ is on the process of publishing. DMMN is the Chairperson of the “Myanmar Marionette Comittee” and the vice secretary of ‘The Myanmar Theatrical Foundation’ on the other hand. She starts running her theatre with a new as ‘Myanmar Marionette Theatre’ in January 2015. 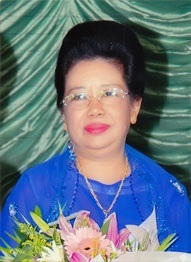 Daw Ma Ma Naing is the Chairperson of the 'Myanmar Marionette Committee' and the patron of the Myanmar Theatrical Organization, Yangon. She starts running her theatre with a new name by 'Myanmar Marionette Theatre in January 2015'. In the Past, Myanmar Puppetry was not only for entertainment, but also a high art held in much esteem by all classes. Marionette were a means of making people aware of current events, a medium for educating the people in literature, history and religion, display of lifestyles and customs. At the same time, they functioned as mouthpieces for the people in the days of royalty, tiny hands in state and social affairs. Nowadays, the old traditional marionette generation has almost faded away. This is simply due to the lack of patronage required during the last few decades. Therefore, it has come to pass that the art of marionette is referred to as a dying art that was rapidly disappearing with the advance of modern entertainment. The same story is applicable to the artists. So we, a private team of professional artists, like to restore this folk art and have arranged a special marionette show for visitors to Mandalay, the centre of Myanmar arts and culture. We consider that this show would be of great interest to tourists and also a good help to give them an idea of ancient Myanmar and Myanmar culture. 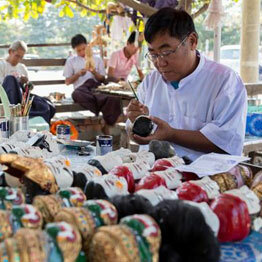 Our private team of professional artists has been trying to preserve our Myanmar puppetry which still holds its own national characteristics and the original Myanmar tradition as it includes all the artistic works such as Myanmar dancing and music, sculpture, sequin embroidery and painting. Therefore, we have been searching for talented young puppeteers. We let them present their talent on our stage and let them convey this talent to the next generation as well as to the world. Our theatre team is also taking an active part in social welfare of the locals. As an Example of currently collaborated with 'Mandalay Region Libraries Foundation' to improve the awareness of 'Reading is Power' through puppet plays among the school children at schools. In order to carry out the above mentioned tasks and to be more efficient in exchanging ideas with other cultural counter parts from abroad, Mandalay Marionette, which was an ordinary family entertainment group, has formed itself as a company limited.